Posted on September 19, 2015, in Anime, Review and tagged High School Romantic Comedy, Steins;Gate, Time Travel, Toradora!. Bookmark the permalink. 2 Comments. Heh, two of my favorites. 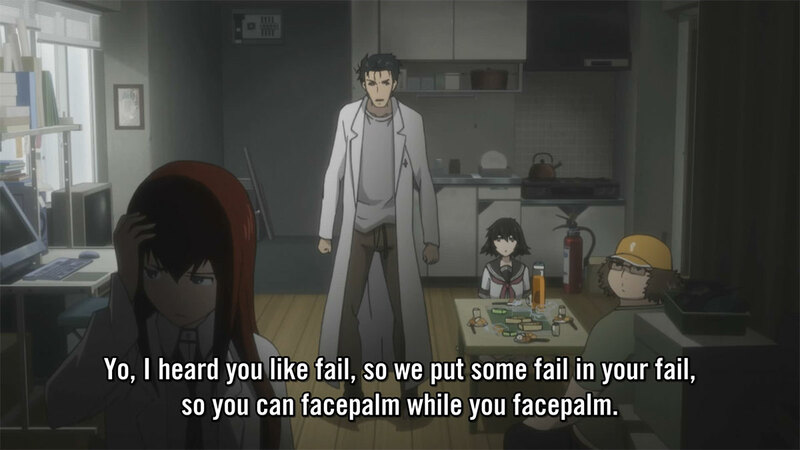 I love both Stein’s;Gate and Toradora. Toradora in particular is a show that I like to rewatch, which is pretty rare. If you’re looking for something to watch next, I recommend Cross Game. It’s really good. I do not have a list, but that’s amazing. I’ve been meaning to come up with some sort of passive system of recommendations, but the Currently Playing sidebar is easy to miss and straight-up reviews seem like overkill sometimes. All this time I’ve been linking that website simply because it had more info and less spoilers than simply linking to Google. I’m currently watching School-Live!, but I’ll keep that (and your list) in mind for the future.